Charles Saatchi sets up a strange competition between Russia’s contemporary works in the gallery downstairs and the Soviet-era underground art upstairs. Tattoo print by Sergei Vasiliev, Source: Courtesy of Saatchi Gallery. The Saatchi Gallery’s first exhibition of contemporary Russian art opened late November in London. Charles Saatchi’s tastes as a collector tend towards hard-hitting works that shock the viewer and the current show is no exception. It intersperses photography and installations with paintings, like Valery Koshlyakov’s monumental buildings, daubed on disintegrating cardboard, or Dasha Shishkin’s detailed multi-colored satires with their mutant, long-nosed socialites in designer dresses. The works are interesting enough, but the timing is unfortunate. The fact that this huge, sometimes overbearing show coincides with a display of really remarkable Moscow art from the 1960s to 1980s (on the top floor) means the historic exhibition has so far gotten less attention than it should. There are things worth seeing in “Gaiety is the Most Outstanding Feature of the Soviet Union,” but it is erratic. The ironic and cumbersome title is a quote from a 1935 speech by Stalin. It does little to illuminate the works on show, all of which were made since the break-up of the Soviet Union, except in its heavy-handed highlighting of the continuing bleakness of some aspects of Russian life and exploration of Soviet legacy. Physical deterioration and mutilation are recurrent themes. 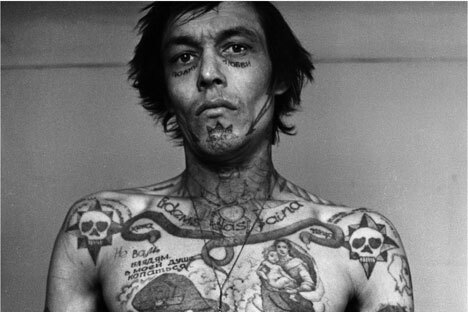 The show opens with an arresting room full of larger-than-life-sized criminal tattoos, photographed in black and white by Sergei Vasiliev. There is a powerful contrast between the writhing pictures on their bodies and the calm resignation of the prisoners’ faces. Vikenti Nilin’s photographs are equally compelling. His series “Neighbours” shows people sitting peacefully on the window ledges of Soviet tower blocks. In some shots, we look over the shoulder of a man in a suit to see the five-floor drop beneath his dangling feet. At the other end of the subtlety spectrum, the un-ignorable work of Gosha Ostretsov spells out its political statements in neon-splattered, cartoonish installations. “Criminal Government” shows a row of cells (whose numbers are variations on 666) in which individuals in suits and masks are mutilated, dead or dying. Painted, latex masks have featured in several of Ostretsov’s exhibitions and performances exploring power. Although his work looks like a teenager’s bedroom, he is not particularly young. Born in Moscow in 1967, he is now working there again, after a decade in Paris. Among other engaging works on show are Daniel Bragin’s “Bedtime Story,” a kid’s blanket made of smashed windscreens, and Dasha Fursey’s “Boundary Post of a Cat Bajun,” a glass-jar-tower containing pickled cucumbers, berries and mushrooms. Homeless people by Boris Mikhailov. Source: Courtesy of Saatchi Gallery. On the next floor up, Boris Mikhailov’s intimate and moving photographs show homeless people, their bodies often naked, scarred or suppurating, their faces prematurely aged. The smaller prints draw the viewer in, while the wall-sized ones repel. Mikhailov, born in what is now Ukraine in 1938, is the only really well-known figure in the exhibition.